Nand lal Sharma, CMD SJVN in a exclusive conversation. 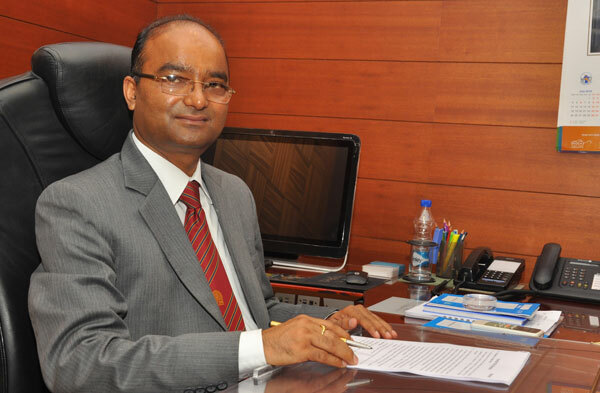 Surpassing the MoU targets of generating 8950 million units of electricity, public sector SJVN Limited has achieved generation of 9280 million units from its four power plants in operation in various parts of the country, during the financial year 2017-18, said Nand Lal Sharma, Chairman & Managing Director of the Company in an exclusive talk with Himachal Scape. He informed that the past financial year had been spectacular in electricity generation as the company’s 1500 MW Nathpa Jhakri Hydro Power Station in Himachal Pradesh had surpassed the MoU targets by 232 million units with the generation of 7207.67 million units while the downstream 412 MW Rampur Hydro Power Station had also surpassed the MoU targets by 94 million units with the ever highest generation of 2014 million units. SJVN’s 47.6 MW wind power station at Khirvire in Ahmednagar district of Maharashtra had generated 51 million units of electricity and its 5 MW Charnkha Solar Power Plant in Gujarat had produced 6.5 Million units of electricity during the year. Sharma further informed that hydro power was the core strength of the company and it had been successfully operating the country’s largest 1500 MW Nathpa Jhakri power station most efficiently since commencement of commercial operations in the year 2004. Similarly, the 412 MW Rampur Hydro Power Station, in operation since 2014, had continued to establish new benchmarks of generation and had achieved the ever highest generation during the last financial year. Both the power plants, he told, had established an APAF of over 99 percent against the hydro power industry average of 90 percent. He told that the generating machines of both the plants had already undergone their annual maintenance and were ready to perform at full capacity during the coming summer season. The Nathpa Jhakri Hydro Power station,he added, was nearing cumulative generation of one lac million units of electricity during the 14 years of its successful operations. Nand Lal Sharma told that on account of its excellent performance during the year, the company had declared an interim dividend of Rs785.95 crore at the rate of Rs1.90 per equity share and the same had already been paid to the equity shareholders. While the Government of India holding 64.46 percent equity had been paid a dividend of Rs504.75 crore, the government of Himachal Pradesh holding 25.51 percent equity had been paid Rs 200.45 crore, and the general public holding 10.03 percent equity had been paid Rs 81.75 crore. Sharma informed that the company had taken another leap in the hydro power sector with commencement of construction at its 60 MW Naitwar Mori Hydro Power Project in Uttarakhand. The Foundation stone of the project, he said, had been laid by the Union Minister of State for Power R.K. Singh on 30th March 2018. He added that the company was also in the process of implementing 10 hydro power projects with an aggregate capacity of 3218 MW in various states of India and in neighboring countries namely Nepal and Bhutan. Additionally, SJVN, he told was also in the process of implementing a 50 MW wind power project in Gujarat and a 1320 MW thermal power project in Bihar.